After spending the night of August 23, 2016 at the Bright Angel Campground, it was time to head back up to the top. While heading up is a change in elevation of about a mile, in some ways it’s not as hard. For one, you’ve eaten some of your food so your pack is lighter. For another, you don’t have to carry as much water, since you can refill at Indian Garden (and then at the 3-mile and 1½-mile Resthouses). 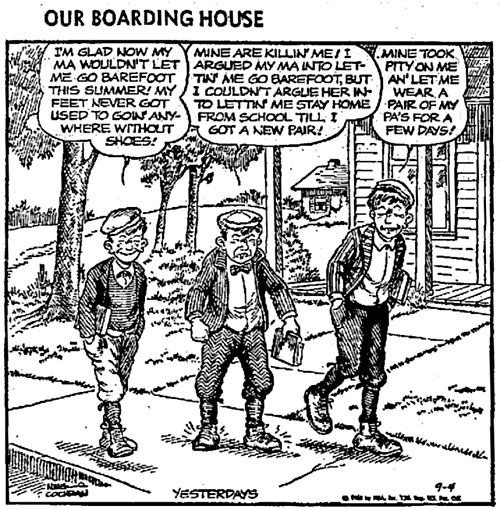 Today’s comic comes from Our Boarding House, which ran from 1921 through 1984. This particular one is from September 4, 1968. It has a (troublesome) theme we’ve seen many times before. On the other hand, this one is particularly pernicious. Note that it approves of smashing and distorting feet. You just need to squeeze and reshape them to fit shoes. The third kid has shoes that probably come close to actually fitting, but that will soon be rectified as they gradually inure his feet to being misshapen. 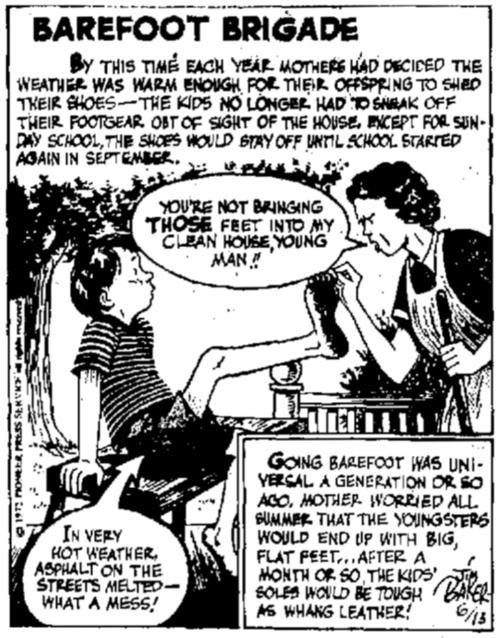 I always love Red and Rover for the casual look at how kids used to go barefoot during the summer. This one, from June 29, 2016, is just plain-old cute. In writing up my trip Out West, it’s now time for my backpacking trip down to the bottom of the Grand Canyon, where I camped at the Bright Angel Campground (after getting a permit). This was on August 23, 2016. Here’s our comic for today. It’s from a strip called “As You Were” (not to be confused with the later punk comix) that ran from 1972 to 1995, written by Jim Baker. This comic appeared on June 13, 1972. When my youngest son was about 8 years old, he walked (barefoot) across a newly patched batch of thick asphalt on our street . . . and got stuck. Fortunately, his older brother and sister were with him and helped pull him out. And I got to get out the turpentine to clean off his feet. I’m still trying to catch up documenting my trip Out West this past summer. I’ve now made it to the day just before I headed down to the bottom of the Grand Canyon, August 22, 2016. That day (while waiting to get a response from the Park Management about my bus issues) I spent my time driving out and visiting Desert View.